When it comes to sharing eLearning content and tracking learner result, eLearning content packages (e.g. SCORM, AICC, xAPI, etc.) will be of help to you. ActivePresenter allows exporting the content to two popular versions of SCORM currently which are SCORM 1.2 and SCORM 2004, and xAPI. This article will show you how to export projects to SCORM and xAPI. Remember that in ActivePresenter, you can only pack the content when you choose to export it to HTML5. An eLearning content package is a file containing course content in a database metadata. It’s used to define the learning content or assessment that can be delivered by a learning management system (LMS). Step 1: in the Export tab, click HTML5. 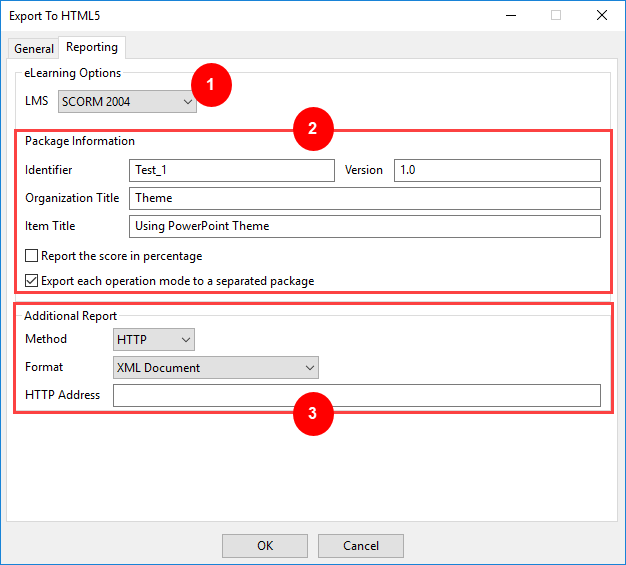 Step 2: Open the Reporting tab of the Export To HTML5 window that pops up. Step 3: In the eLearning Options section, access the LMS box (1) and select one option from the list (SCORM 1.2, SCORM 2004, and xAPI). There are some differences between two types of content package that ActivePresenter provides. For details, see The Differences Between SCORM and xAPI. You should define some information of the eLearning content package (2). This makes the tracking and managing become easier when you upload the content package to an LMS. Note: The properties in this section may vary differently when you choose to export to SCORM or xAPI. Identifier: Specify a name used by the LMS to identify different manifests. If you upload more than one course to an LMS, their identifier must be different from each other. Version: Specify a version that can be used to differentiate manifests with the same identifier. Organization Title: Specify a title for the organization which this item belongs to. Item Title: The title of your project that is displayed to users viewing the project using an LMS. Description: The description of your project that is displayed to users viewing the project using an LMS. Report the score in percentage: Normalize the score in the range 1 – 100 instead of an absolute value. This option is only available in SCORM 2004. The score in SCORM 1.2 and xAPI are always normalized. Export each operation mode to a separated package: Export each operation mode to a separated package instead of exporting all of them to one package with multiple organizations. For more details about how to track learners with an LMS, you can refer to Uploading an ActivePresenter project to a Learning Management System. The Additional Report section (3) is to specify the additional method for the report. It’s useful when you don’t have an LMS or you want to handle the report by yourself. In general, when you export your project to an eLearning package, you don’t need to work with this section. No Report: Do not send the report. HTTP Address: This is the HTTP address of a server side script that will process the report data (the data is either in XML or JSON format). So, that’s how to export projects to SCORM and xAPI in ActivePresenter 7. Hope that it helps.